Located at the Château de la Place, in Charente-Maritime, 30 minutes from Royan and Saintes, the Escape Place of more than 100 m2 awaits you ! Enter in a closed and mysterious space and try to escape by finding the key to the enigmas of your adventure. Accessible to all, in a team of 3 to 6 people, you will have an hour to get out ! With friends or with your colleagues, come and test your thinking skills and your team spirit in 3 historic adventures of which one outdoors where you will have to keep your cool ! So try the adventure ! Resistance I, next part : You have just find the secret documents ! Run away as fast as you can because the area is full of german soldiers and find the meeting point to deliver the documents to the english parachutist. What really happened aboard Titanic ? Will you know how to solve the century's riddle ? The Titanic April 14, 1912. April 14, 1912. Crew members on the Titanic, you conduct your investigation in the cockpit a few hours before the tragedy. what terrible secret are you going to discover? will you be able to save your lives and those of the 2 200 passengers? 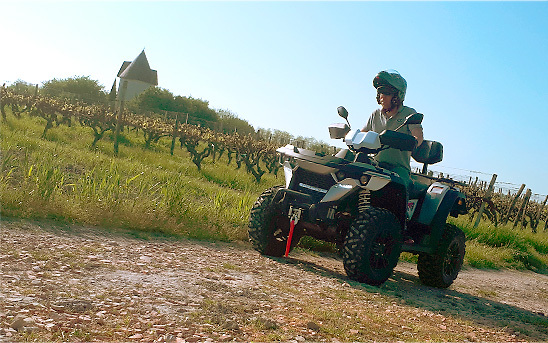 Quads rental for accompanied excursion of 1:30 or 3:30. Enjoy exciting sensations with your family or friends discovering the estuary !